The CDC has established December 2-8 as National Influenza Vaccination Week. The goal is to convey the importance of a flu shot in the prevention of influenza. Although some believe the holiday season may be too late for a flu shot, the CDC wants everyone to know that a vaccination makes sense now, and even beyond the holidays. As long as there are flu viruses circulating, a flu shot is your best defense. After all, no one wants to be sick over the holidays. Even if you’ve already experienced one type of flu virus, you still need to protect yourself against other types of influenza you may be exposed to during the busy holiday season. According to CDC estimates, there were more than 49 million cases of the flu reported during the 2017-2018 flu season. That’s more than the population of Florida and Texas combined. Although most people recovered within a few days to a few weeks, 960,000 of these cases required hospitalization, and 79,000 resulted in death. Given these statistics, it simply makes sense to get vaccinated to prevent the flu altogether. Most seasonal flu shots will protect you against the three to four types of viruses that the CDC expects to be prevalent during the current flu season. 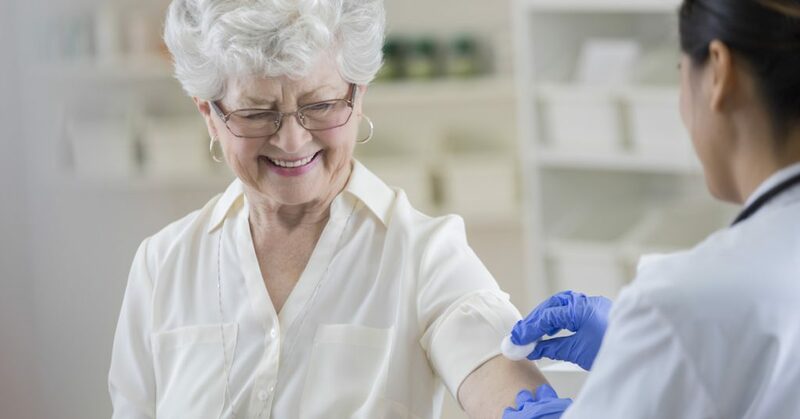 Although the specific type of flu shot you receive will be based on your age and other health factors, there is no one vaccine considered to be more effective than another. Nearly all vaccines are administered in the arm, via a needle and it takes about 2 weeks for the vaccine to confer protection. After receiving a flu vaccination, some people experience soreness, redness, tenderness, or swelling in the area that received the shot. Headaches, muscle aches, and low-grade fever may also occur. These are not signs that you’re getting the flu, since you can’t get influenza from the flu shot itself. Although rare, the flu vaccine can cause severe allergic reactions in certain people. If you have a history of allergies or have experienced a severe reaction to a flu vaccine in the past, you should let your healthcare provider know. Simply put, anyone over the age of six months should get a flu shot every season. It’s your best shot at influenza prevention. The effectiveness of the vaccine will depend on the particular strain of flu virus or viruses circulating that season. Even an ineffective flu vaccine is better than none, however. If nothing else, it will lessen the severity and duration of your symptoms in the event that you do come down with the flu. Equally important, a flu shot does more than simply protect you. It also protects those around you. This is especially important if you come into contact with people who have chronic conditions such as diabetes or lung disease. Pregnant women and young children are also at high risk, and have much to gain from influenza prevention. The flu vaccine protects women both during and after pregnancy, and according to a 2017 study, it can be life-saving for children. You should also make sure you get enough sleep, stay physically active, manage stress, drink plenty of fluids, and eat a healthy, nutritious diet. For more flu prevention tips and advice on how to prevent the flu, check out our related article, How to Prevent the Flu at School and Work. If you haven’t yet received this season’s flu vaccine, there’s still time. Head to your local FastMed clinic today. If you’ve already come down with influenza, FastMed can help you recover faster. There’s no need for an appointment. Simply walk in during our convenient extended hours, seven days a week, holidays included. To save time, check in online and complete your e-registration before you arrive.